Miss Supranational, Valeria Vazquez, just returned to Poland following five exciting days in Cannes, France where she was a special guest of MIPTV at the MIPTV 2019 and Cannes Series (Season 2) events. During her time in Cannes, Valeria appeared on the pink carpet at the opening of Cannes Series, visited the MIP Markets exhibition and had the opportunity to meet television executives from around the world at the opening night of the annual event. 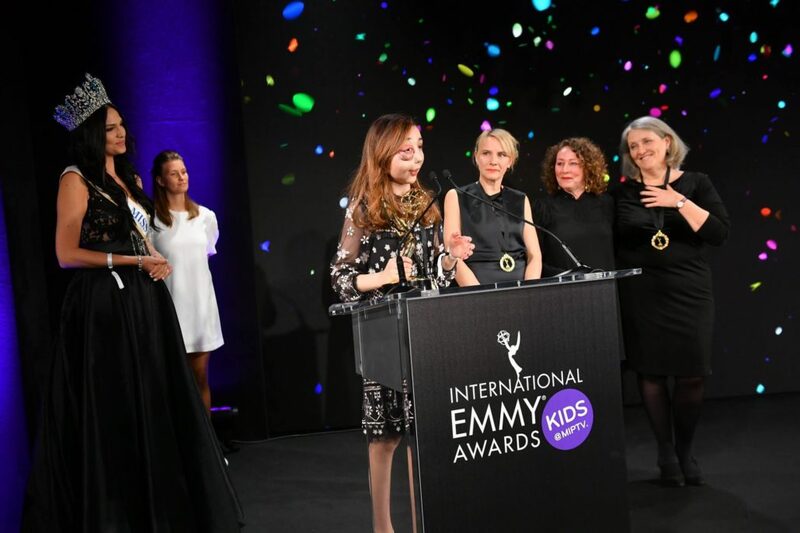 Valeria was also invited to be a presenter at the International Emmy Kids Awards where she presented the final award of the evening. The International Academy of Television Arts and Sciences (Emmys for short) is one of the biggest and most prestigious award shows of its kind and recognizes excellence in programs from all over the world. Taking home the International Emmy for Kids Factual was 14 year old Nikki Lilly from London, England. Niki was born with an illness called arteriovenous malformation (AVM) and starting showing signs of the disease at age 6. The rare medical condition gives her heavy nosebleeds and headaches. At the age of 8, she started a YouTube channel to show people what her life was like and her channel currently has more than 700,000 subscribers and her videos have been viewed almost 50 million times. Niki is an active campaigner that wants to teach people about what it is like to life with this illness and also spread a positive message about how beauty comes from within. My Life – Born to Vlog is a BBC documentary that follows Nikki’s journey and is shown on Children’s BBC (CBBC). In the press room, immediately after the event, Valeria stopped the photographers, took her crown from her head and placed on Nikki’s. “I feel like I should crown the real queen of the night,” she told the 14 year old. “Nikki’s story touched my heart and I feel that she is a role model and inspiration to myself and so many people in the world. It goes with my own belief that beauty is relative and it is confidence and the way you live your life and overcome obstacles in which true beauty lies. I feel so honored that I got to award the Emmy to such a phenomenal young woman,” Valeria reflected afterwards.